I feel bad for the Battlestation: Harbinger developer, as I think it's a pretty nice name but another developer has coined the "Battlestation" term so they have to change their name. They will also be doing a free update soon. The other developer is at least being nice about it and isn't trying to sue them, so that's something at least. - New Human space ship named "BSE Trademark", with the letters TM written all over it, to celebrate this blunder. - Unlock and play with Alien ships! To celebrate the world of trademarks you can now "trademark" those pesky alien ships. Many of you have mentioned wanting to play with alien ships, your wish will come true! - As a bonus, some ships from the ship menu unlock list will be added to reinforcement ship list. See my previous thoughts on it here. 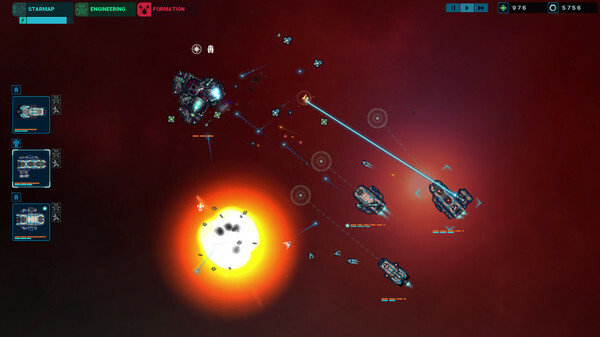 Battlestation: Harbinger is a hard sci-fi space exploration game blending roguelike, turn-based, star map strategy, and real-time space battles. You are a young commander given the task to venture out into enemy territories, far away from home to unknown galaxies, never knowing what you will face as you jump out from hyperspace. Hate these overly broad trademarks that seem to be granted these days (always were?). It's not as bad as the "Wasteland" debacle which made inXile lose a lot of respect from me even though I'm still very interested in Torment. Still don't think any one developer should have total control over the word "Battlestation" in game titles either. Yeah, "battlestation" is a word, it's been around in SF for decades. And OK, Apple is a word too, but you can trademark "Apple" used as a reference to a computer (as opposed to a fruit). But here we're looking at someone using the word "Battlestation" in reference, near as I can make out, to there being battlestations in the game. If someone had a brand of vacuum cleaner or air conditioner or something and decided to call it "battlestation", then that would be reasonable to trademark, and then reasonably nobody else would be able to call their vacuum cleaners "Battlestation" vacuum cleaners. But a trademark able to stop people from using the word "Battlestation" for a game about battlestations seems wrong to me. Next they'll be trademarking a brand of actual apples so nobody else can call their apples apples. Then the rest of us would have to call our apples "oranges" or something, and then how would you compare them . . . Honestly, I think companies should only be granted trademark protection over one single word at a time. Apple can be "Apple" if they want, but not "Macintosh," or "iAnything." If inXile wants to trademark "Wasteland" they can, but in doing so they lose the rights to the words "inXile" and "Torment." Obviously there are flaws in this plan, but I think that it would quickly change the culture and make companies loosen up so that they would only bother going after actually damaging infringements.